DREAM believes that early childhood education is key to providing children with a head start. Our programs allow children to grow and develop at their own pace while encouraging play and exploration in a safe learning environment. With the support of family and caregivers, developmental progress is reinforced in the home, ensuring that all children arrive at school ready to learn. DREAM’s early childhood programs address the needs of young children 2-7 years old in three key areas: birth registration, parent education, and Montessori classrooms. How can you learn if you don’t legally exist? In the Dominican Republic, nearly one in five children under age five do not have a birth certificate. The LUCEROS Documentation Program helps families ensure that a lack of legal documentation does not deprive their children of the education and services so important to breaking the cycle of poverty. Click here to learn more. Between birth and five years of age, more than 90% of brain development occurs, yet many children enter school without key skills essential to nurture this critical period. The School for Parents teaches parents evidence-based child development strategies, fostering active parent involvement and ensuring children are ready to learn from day one. Click here to learn more. 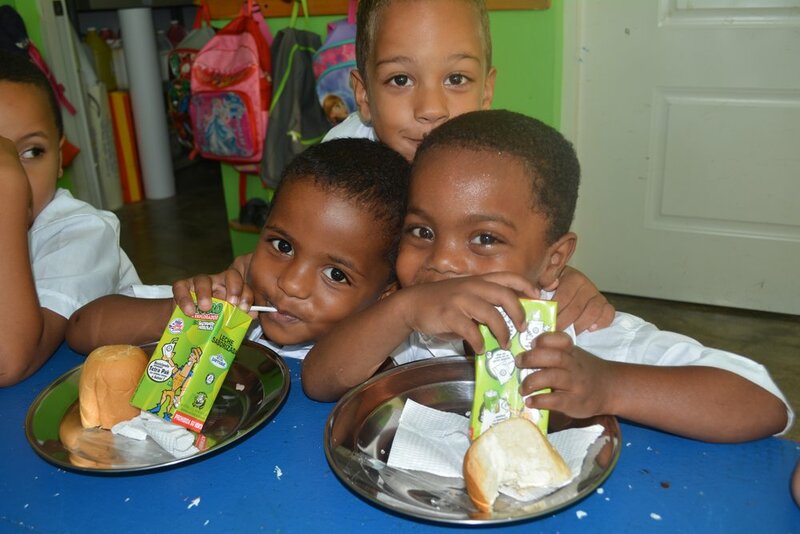 Only 32% of Dominican children attend preschool, and only 16% are from low-income families. The Montessori Early Childhood Education Program uses proven Montessori methods to foster classroom learning, independence, and age-appropriate development through active discovery. Click here to learn more. When does "too early" end and "ready" begin? Music Education and Literacy are highly effective in engaging young learners and stimulating brain development. DREAM begins teaching these innovative programs early, so our young learners have access to new, fun, programs. DREAM prioritizes opening doors for all young learners, including those with special needs. Anibelka joined our Montessori program when she was 5 years old. At first she didn’t talk much, had trouble walking, and rarely participated in the social life of the classroom. She now knows the names and interests of all her classmates, communicates verbally, is learning her vowels, and shares with her friends. She loves the Practical Life activities, and even practices them at home. Anibelka, a caring student with Down’s syndrome, has taught us all about diversity, strength, and overcoming challenges. Anibelka and her family are an excellent example of perseverance and a love for learning. This outstanding team of teachers works together in two of our communities in Cabarete. Both show a unique dedication and commitment to helping their students learn and grow. Danilsi began working with DREAM as a parent volunteer when her oldest daughter was three years old and attended the Montessori program. During this time, Danilsi was studying at night in Sosúa to finish high school. She fell in love with the Montessori program and, once she graduated, she worked tirelessly to become certified as a Montessori teacher and is now studying Early Childhood Education at the local university. Her co-teacher, Wilner, also came to DREAM in 2008 as a parent volunteer when his oldest son participated in the program. The following year, he began working in the classroom and finished his high school education. Both teachers are thankful that DREAM gave them the support to continue studying and become professional teachers in their home community.